OS grid reference: SE 5960 5271. At the corner of Burton Stone Lane and in front of the Burton Stone Inn at Clifton, York, is the Medieval plague stone known as ‘The Burton Stone’. According to local legend, it was long ago a cross-base for perhaps three Medieval crosses, but in more recent centuries it had become a ‘plague stone’ and its three hollows (sockets) perhaps used as recepticals for vinegar! But whether the stone is in its original position is open to question. 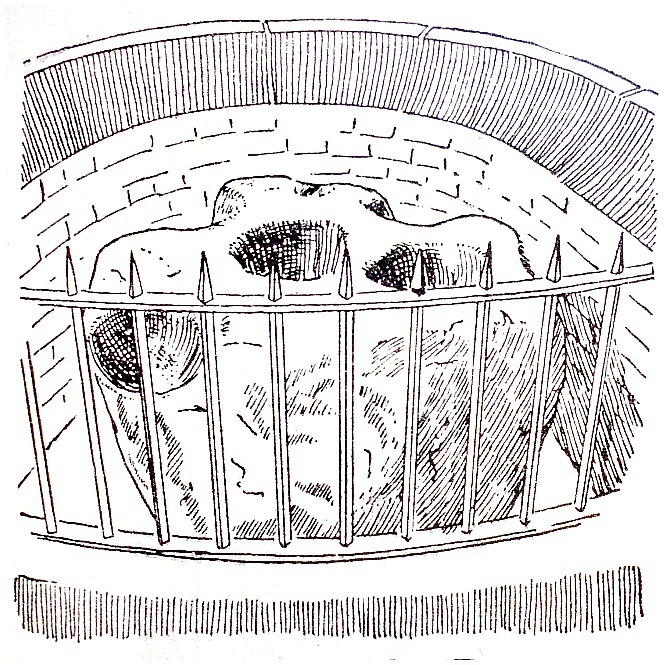 The stone now lies in a brick niche behind iron railings at the front of the Burton Stone Inn at the corner of Burton Stone Lane and the A19 Clifton Road, where prior to the pub there was an ancient chapel dedicated to St Mary. Clifton is a suburb of York. The city centre lies about 1 mile to the south down the A19 road. The Burton Stone is a large lump of stone that is roundish in shape and at one side is shaped like a cross. It has three basin-like hollows that were originally socket holes for crosses, but over time these have been worn smooth by human hands. What happened to the crosses that stood in the socket holes is not known but they were probably associated with the Medieval chapel that stood on this site, and which was dedicated to St Mary Magdalene. The Burton Stone may have marked a city boundary or a line of jurisdiction. The ancient chapel was perhaps a pilgrims’ chapel or a chapel-of-ease as York Minister is only a short walk down the road. But after the chapel’s demise the cross-base was put into use as a ‘plague stone’ and the three holes became recepticals for vinegar. Coins were also placed in the vinegar solution as a way of sterilization and then handed out to families affected by the plague, or cholera epidemics, which struck the city of York from 1604 onwards. Local legend says that Mother Shipton (1488-1561) the Yorkshire prophetess rested beside the Burton Stone in 1512 – at which time she also married Toby Shipton of York. Categories: Ancient Crosses, Misc Subjects | Tags: The Burton Stone at Clifton near York | Permalink.